Liberating, progressive, made for pleasure- very un-English?! Seafront The Palace Pier and 2kms of Esplanade – and apparently 10 billion stones on the beach! 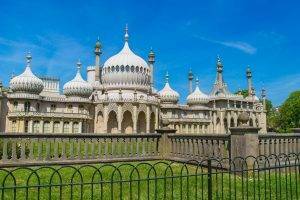 City status: In 1997, Brighton and Hove were joined to form the unitary authority of Brighton and Hove, which was granted city status by Queen Elizabeth II as part of the millennium celebrations in 2000. Some famous inhabitants: Sir Winston Churchill (politician), Nicholas Grimshaw (architect), Nigel Kennedy (violinist), Max Miller (comedian), John Osborne (playwright), Terence Rattigan (playwright), Dame Anita Roddick (founder of The Body Shop, opened the first shop in Kensington Gardens, Brighton in 1976), Leo Sayer (singer), Paul Scofield (actor), home of fictional Det Insp Roy Grace in the novels of Peter James. 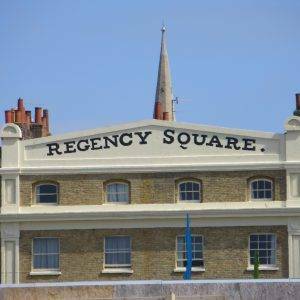 Notable city architects/planners: Amon Henry Wilds (1784-1857), together with his son and Charles Busby, led the surge in residential construction and development in early 19th-century Brighton, building nearly 4,000 new houses in the Regency style. Ken Fines, Borough Planning Officer from 1974 to 1983. Number of Listed Buildings: 1,226, of which 24 are Grade I and 71 Grade II*. “But the atmosphere of Brighton is more than any other English town like that of a Continental city, with a spirit of elegance and gaiety, and the promise of delight.” Clifford Musgrove, 1951. The mainstay of Brighton’s economy for the first 700 years of its existence was fishing. Open land called the Hempshares (the site of the present Lanes) provided hemp for ropes; sails were made from flax grown in Hove; nets were dried and boats were kept on the open land which became Old Steine; and fishermen lived and worked on the foreshore below the East Cliff, in an area known as Lower Town. 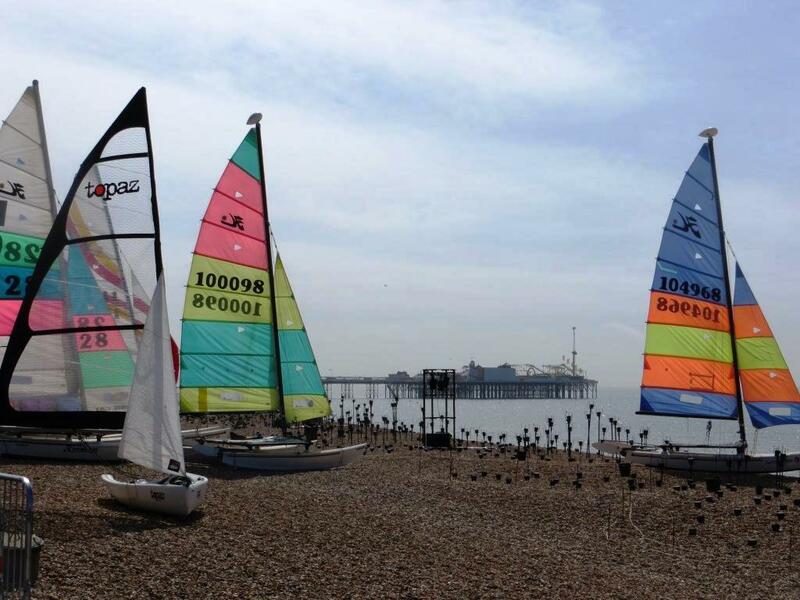 By the late 16th century Brighton’s 80-boat, 10,000-net fleet was the largest in southern England and employed 400 men. Herring and mackerel were the main products, but plaice, cod and conger eels were also fished. But it was not until the early 18th century when the population had only reached about 2,000 people and the town was still called Brighthelmston, that the town began to grow in ambition and expand beyond its fishing base. The contemporary fad for drinking and bathing in seawater as a cure for illnesses was enthusiastically encouraged by Dr Richard Russell who lived in nearby Lewes. He sent many patients to “take the cure” in the sea at Brighton, published a popular treatise on the subject and moved to the town soon afterwards to cash in on the fashion. From 1780, development of the Georgian terraces got underway, and the fishing village developed into the fashionable resort by now generally called Brighton. The growth of the town was further encouraged by the patronage of the Prince Regent (later King George IV) after his first visit in 1783. He spent much of his leisure time in the town and constructed the Royal Pavilion as a place for escape and indulgence. Another spur to growth was the arrival of the London and Brighton Railway in 1841, which brought the town within the reach of day-trippers from London. The population grew from around 7,000 in 1801 to more than 120,000 by 1901. People came down from the city to the sea specifically to escape the foul air of the capital and to take in the clean air of the seaside. 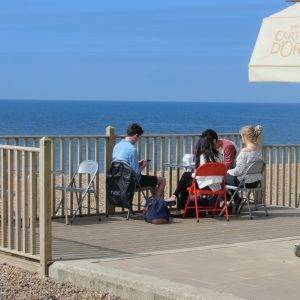 Today Brighton attracts over 8.5 million visitors annually and is the most popular seaside destination in the UK for overseas tourists. The tourism industry employs 20,000 people directly, but the city is about much more than just tourism economically; a report identified it as one of five “supercities for the future”. 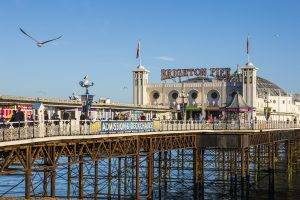 In 2013, Brighton was ranked 3rd on the UK Vitality Index Report, which measures the economic strength of towns and cities in the United Kingdom. It has a high concentration of businesses involved in the media sector, and is often referred to as ‘Silicon Beach’. 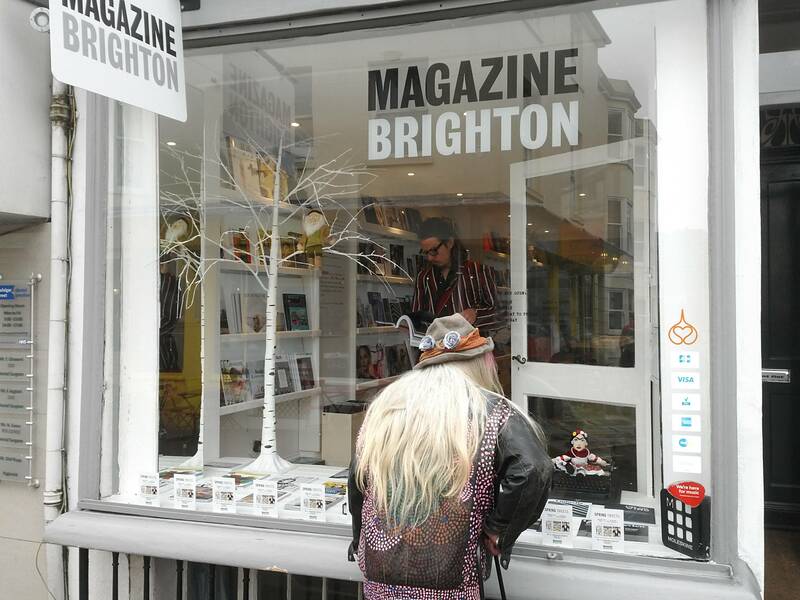 Over 500 new media business have been founded in Brighton. Footnote: Brighton has about 400 restaurants, apparently more per head than anywhere else outside London. This might well slow your walk down! We set out from Brighton Station (1841) one early summer’s morning in high spirits. Everyone always talks about how wonderful and contemporary Brighton is, but I wasn’t sure…I have hardly visited it since I was a highly impressionable young kid, when I used to come with my family to pick up my sister from the ‘boarding school’ on the hill, Roedean; which to its credit, although she rather hated it, taught her science and laid the foundations for her becoming a GP. To a boy, the school had the added mystery of an underground tunnel direct to the beach, which apparently doubled up as an air raid shelter during World War Two. Anyway, back to today. 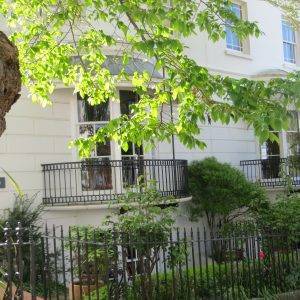 Our route took us first down Camden Terrace, a narrow ‘twitten’ dating back to the 1840s. 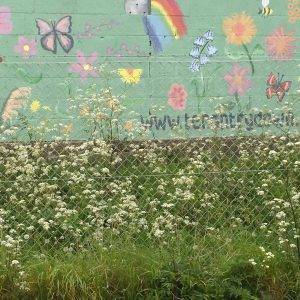 Twitten is an old Sussex dialect word for a path or alleyway. It is still in common use in Sussex and was subsequently adopted by the idealistic builders of the Hampstead Garden Suburb in North London. Also, more recently the word has been used to describe the world’s first two-handed mitten, which I’m sure if you look hard enough you’ll discover later in the walk at the Open Market or in the North Laines. Elsewhere in the country, such alleyways are termed twitchells (north-west Essex, East Hertfordshire and Nottingham), chares (north-east England), ginnels (northern England), opes (Plymouth), jiggers (Liverpool), gitties (Derbyshire and Leicestershire), snickelways (York) and vennels (Scotland). 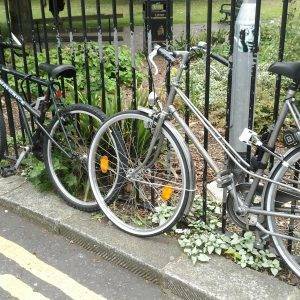 All lovely names, but I love snickleways the best, which you can read all about in our York urban ramble! Anyway, whatever you want to call this alleyway, it’s very useful as we soon come out at St Nicholas’s Church, a lovely little green spot. Situated on high ground, it is both the original parish church of Brighton and the oldest surviving building in Brighton, dating from the mid-14th century; but much modified by Victorian improvers, like so many churches in the mid-nineteenth century. 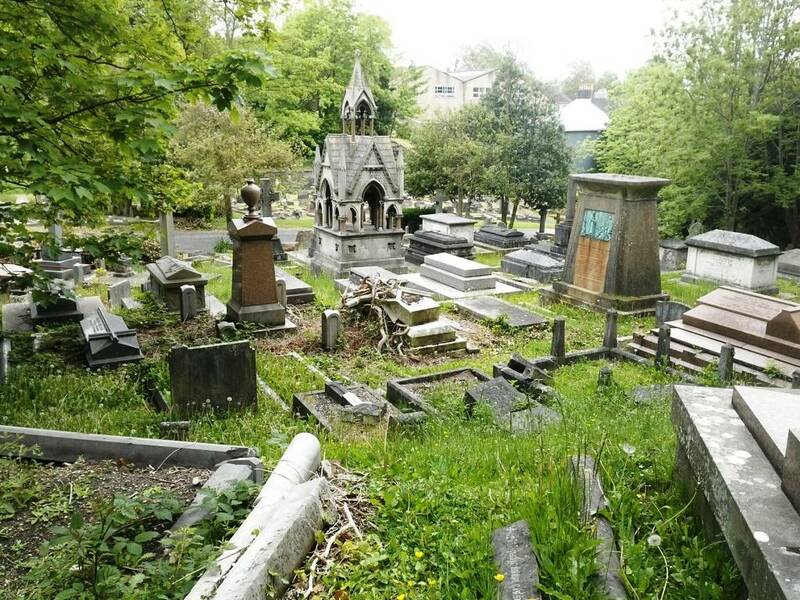 The graveyard is full of Brighton worthies (and a tramp was waking up when we walked through), including Amon Wilds, one of the most important architects of the Regency era, who provided Brighton with much of its Regency architecture. His gravestone is easy to find because of its signature ammonite frieze, a motif he used on many of his designs – no doubt inspired by living by the sea. 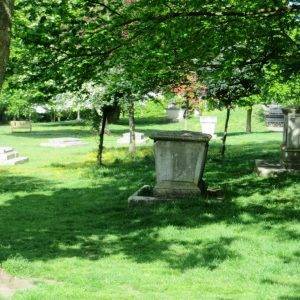 The first extension to the churchyard was built in 1824, across Church Street to the north. This has been converted into a playground. 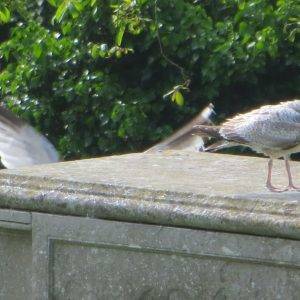 But the most significant change came in 1841 when land to the west of Dyke Road was acquired and used to form a much larger burial ground. This western extension was laid out by the afore-mentioned Amon Wilds and contains a series of vaults with Grade II listed status. It definitely merits a 5-minute detour. Then back through the northern extension and across Dyke Rd into Vine Place, our second ‘twitten’ of the day, which gives access to the tiny one-storey cottages that were the original mill-workers’ cottages to Clifton Windmill. 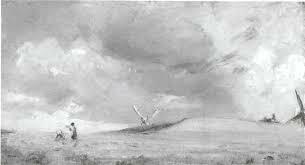 This windmill has alas long gone (the site is now occupied by 6 and 7 Powis Villas), excepting it can be seen in two of Constable’s paintings from the 1820s; the miller’s house, however, ‘Rose Cottage’, is still intact. On our right, as we walked along Victoria Rd, we saw the church of St Michael and All Angels (1862 and 1893) that served the new community of Montpelier and Clifton Hill. It is a Grade I listed building, and in the words of the listing “the architectural quality of both buildings and of their fittings, and the range and quality of the stained glass, make this a building of outstanding importance”. Most notably, The Pre-Raphaelite Brotherhood was closely involved with the decoration of the interior. William Morris himself, along with Philip Webb and Charles Faulkner, were responsible for the painting of the chancel roof. There are also many stained glass windows by Morris in the older building and Burne-Jones in the newer. 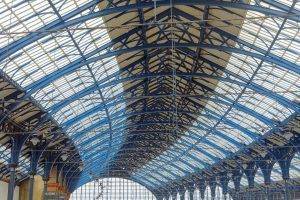 The architectural writers Nicholas Antram and Richard Morrice considered that “no church in Sussex has better Victorian glass”. Next, we come to the Montpelier district of the city. 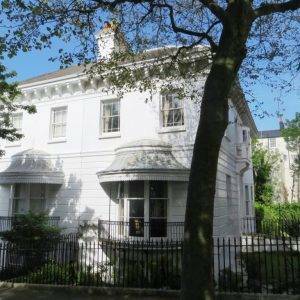 If you like your architecture classical and Regency, you will love this conservation area. We positively drooled as we peered down Montpelier Terrace at the beautiful 1840s stucco-clad terraced houses and villas, all beautifully maintained. 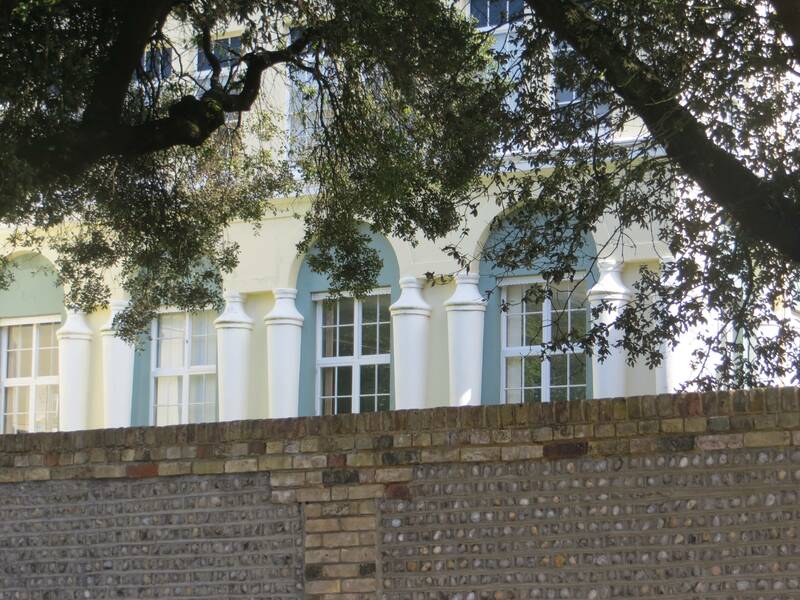 The architectural partnership of Amon Wilds, his son Amon Henry Wilds and Charles Busby – the most important architects in Regency-era Brighton and Hove – were the driving force behind almost the entire Montpelier development. Turning right at Denmark Terrace we see one of Amon Wilds’ best-known buildings, named ‘The Temple’ (middle in the pictures above) after Solomon’s Tomb, the dimensions of which it matched. It was the first significant building in the area, built in 1819 for Thomas Read Kemp, a wealthy landowner. Square and two-storeyed, with five bays on each side and a recessed upper storey, even today it looks very exotic – out of place even – in its setting. Thomas Read Kemp was declared bankrupt in 1837 and it’s partly him we have to thank for the development that rapidly took place on the land that he was forced to sell. 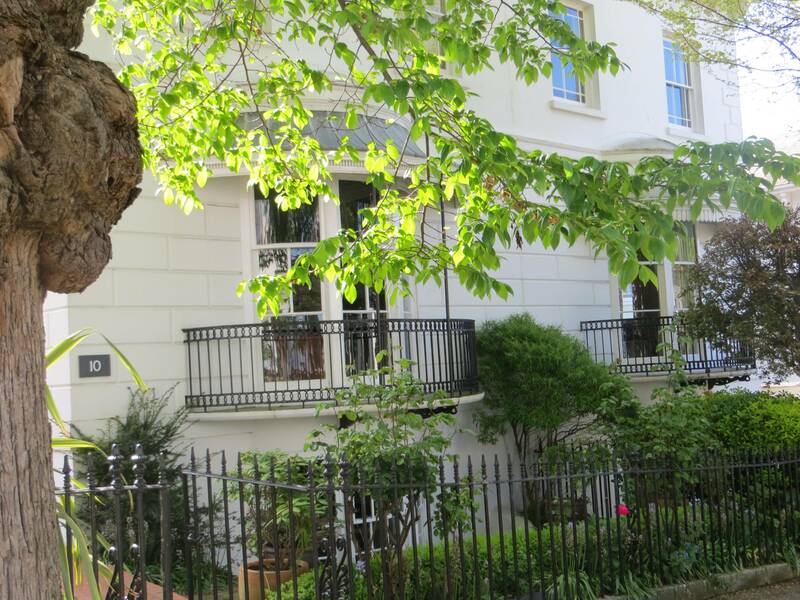 Finally, the ultimate showpiece of this area – Montpelier Crescent, designed by Amon Henry (some of the houses have the distinct ammonite capitals) and mainly built in the 1840s. Rather than a sea view, it was envisaged to have a sight of the South Downs; but within ten years, the downland vista had been obscured by the construction of Vernon Terrace opposite. Never mind. There are still many things to enjoy about this Crescent, not least the variation in house types as it was built over a ten year period, and the generous green space out in front. 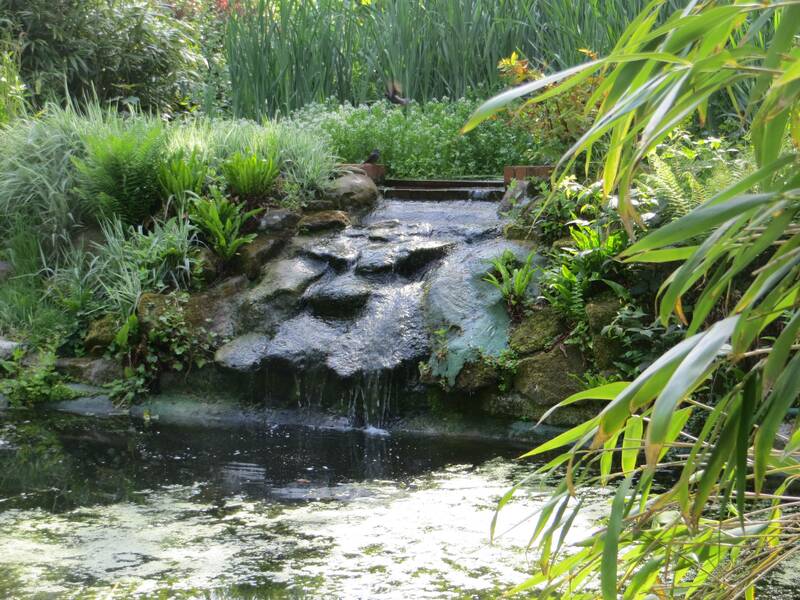 Next, we came to the delightful St Ann’s Well Gardens (5.3 hectares, 13 acres), the spot where Brighton’s reputation as a ‘health spa’ began. It was Dr Richard Russell (1687-1759) who first made St Ann’s Well famous by sending some of his clients to drink the water from a spring here. 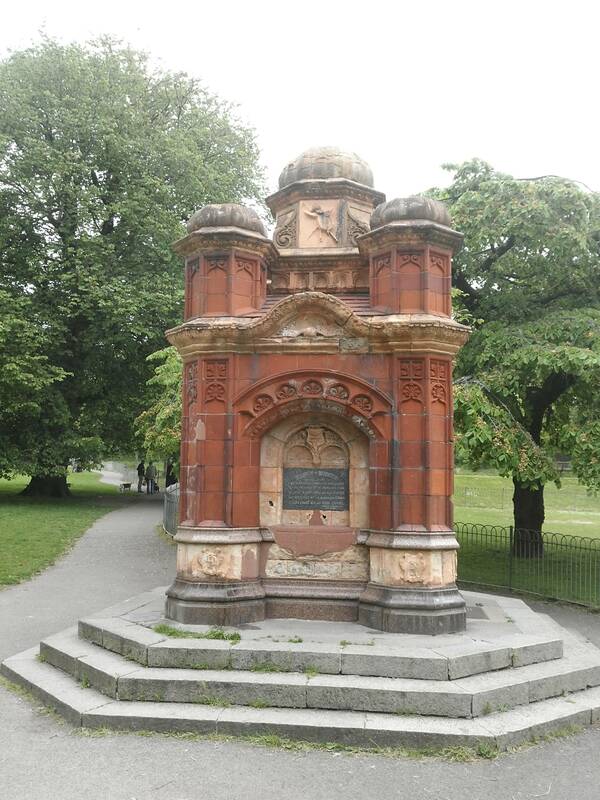 The Chalybeate (containing iron) spring became known as one of the finest natural springs in the whole of Europe. 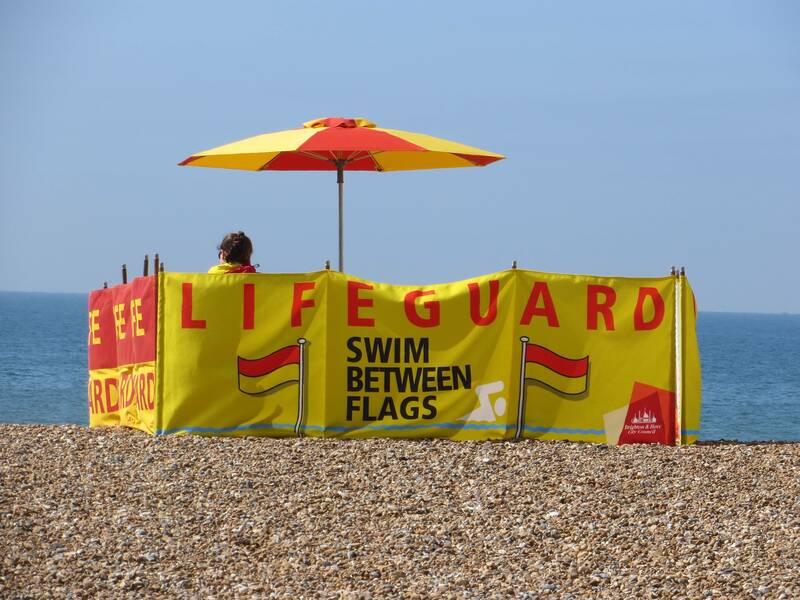 However, the distance of the Spa from the centre of Brighton, competition from other facilities, and a slow decline in the flow of the spring led to the spa’s declining popularity, and it eventually closed. 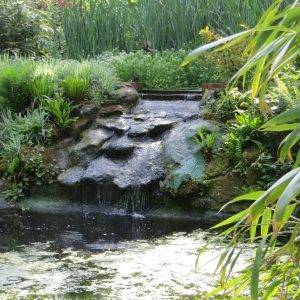 The gardens were subsequently leased by George Albert Smith and he re-named them the ‘St Anne’s Well Pleasure Gardens’. The gardens included novelties such as demonstrations of hot air ballooning and parachute jumps, a monkey house, a fortune teller and a hermit living in a cave. Before Smith came to the gardens he was a hypnotist, illusionist, photographer and he gave lectures on astronomy amongst other things…they’re different, these Brighton folk. In 1908, the council bought the gardens for £10,000 (bargain) and the park was opened to the public on Empire Day in 1908. The park continues to thrive to this day, looked over by the Friends of the Park… and the day we walked through was the occasion of their Spring Festival, which was full of music, drama, creative activities, life and vitality. Plus bungee jumping and zorbing, not so very different really from the hot air ballooning of the past. 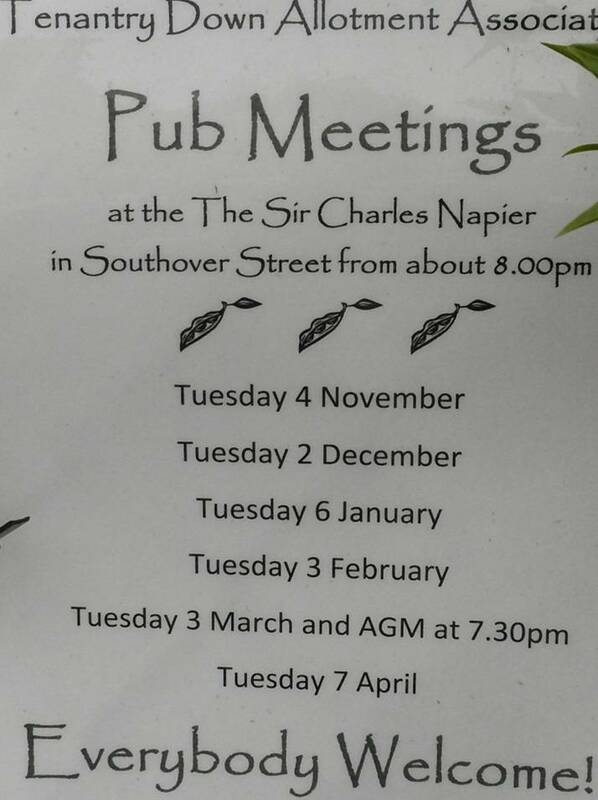 What a great job these Friends do, usually residents that live close by and think ‘IMBY’ rather than ‘NIMBY’. 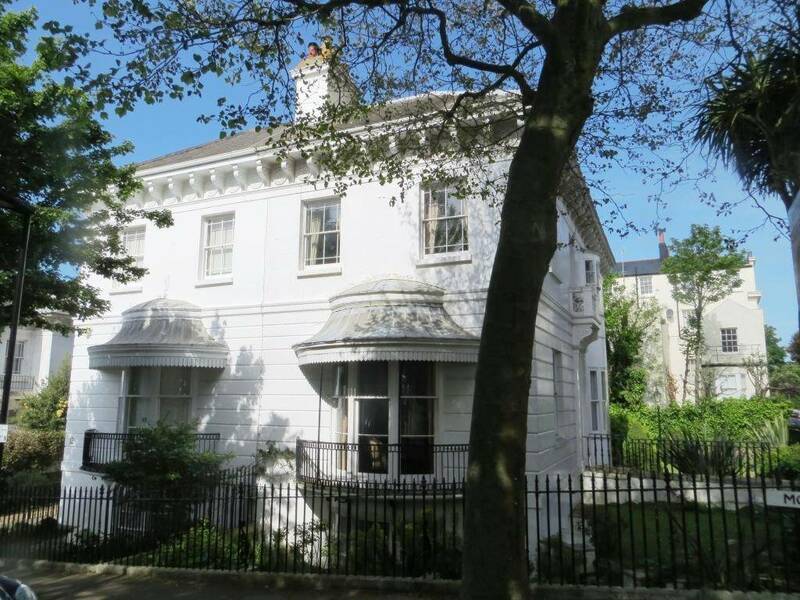 We strolled out through the southern exit to the park and then made our way down towards Brunswick Square, detouring left a couple of streets to 29-30 Brunswick Rd, to take in the stone inscription commemorating the fact that Sir Winston Churchill went to prep school here from 1883-85. The reason for this choice was that the family doctor, Robson Roose, practised in the town. His recommendation was that the ‘fresh sea air’ would be good for the delicate young Winston. Winston’s memories of the school in Hove were more favourable than his previous school, “I was allowed to learn things which interested me: French, history, and lots of poetry by heart, and above all riding and swimming.” A sort of nineteenth-century version of the Brighton effect. Winston was given the freedom of the borough of Brighton in 1947 at a ceremony at the Brighton Pavilion; and perhaps not so luckily for him his name lives on in Brighton at Churchill Square, the town’s main (and very plain) shopping centre. 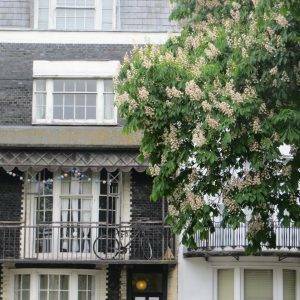 Then we take probably the exact route he would have taken to the sea, through the wonderful green expanse of Brunswick Square (above) – what more could you wish for than a beautiful garden to relax in, three sides of perfect Regency architecture; and on the forth side the sea!! 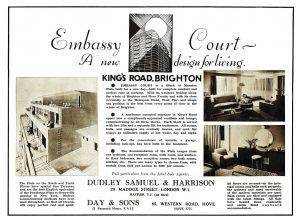 Embassy Court (1935) is an 11-storey block of luxury flats, listed at Grade II*. Wells Coates’ piece of Modernist architecture has divided opinion across the city ever since it was built. When originally envisaged, this lone block was imagined as the beginning of a transformation of the entire seafront, which would have entailed the obliteration of Brunswick Terrace (unbelievable, when you consider it includes a run of 4 grade I listed properties). The abutment with the Regency pillars next door must be one of the most awkward architectural combinations in history, two strangers in the tub trying to avoid touching each other – but in some ways it’s magnificent too, it reflects the attitude of Brighton to allow free expression; anything goes, it’s a melting pot – I love it! 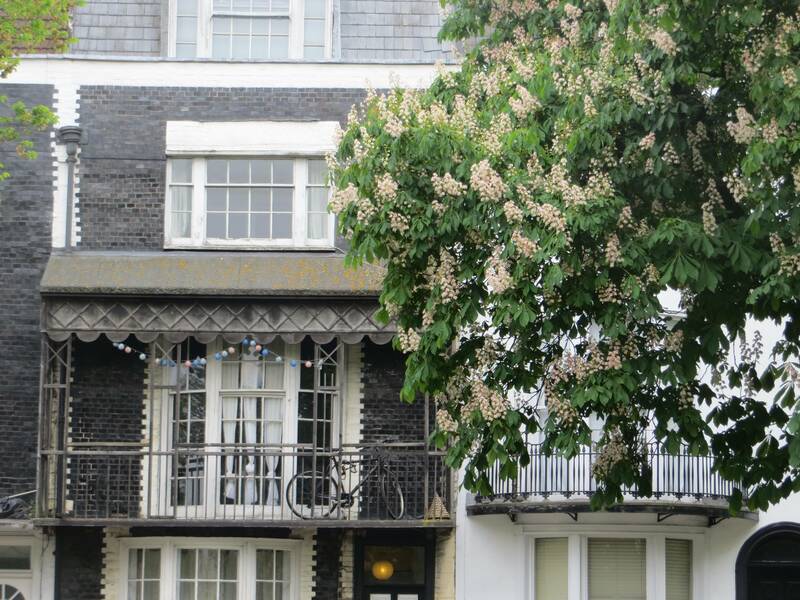 The flats were originally let at high rents to wealthy residents, including Max Miller, Rex Harrison and Terence Rattigan; and features such as enclosed balconies and England’s first penthouse suites made the 72-apartment building one of the most desirable and sought-after addresses in the country. The Modernist layout provided for levels of comfort and amenity that were exceptional for their day. Features included under-floor central heating and constant hot water fed from boilers in the basement to bathrooms, kitchens and the washbasins in the main bedrooms. Built-in electric fires, purpose designed by the architect, provided additional heat. There were telephones in every flat. And in the 1930s its space-saving, fitted kitchens with integral cookers and fridges were almost unheard-of innovations. However, its fortunes changed sharply from the 1970s, as a succession of complex court cases set leaseholders, freeholders and landlords against each other while the building rotted. It is only in the last decade that the disputes have been resolved and a full refurbishment has taken place. I checked out prices, and a 3-bed apartment is going for £650,000 – so it seems its desirability has returned. 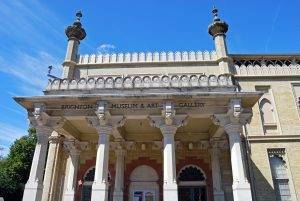 Next onto the true ‘tourist’ part of the trail, poking into the shops of West Pier Arches Creative Quarter, dwelling awhile in the intriguing Brighton Fishing Museum, into the Lanes and then to the epicentre of tourism in these parts, the Brighton Pavilion. For this part of the walk you will feel you are in a different city from the first third and the last third of the walk – and in terms of the mix of people you certainly are; here, mainly tourists, many who have travelled down from London for the day to have fun at the sea, just as was intended when the railway was first constructed in the 1840s. As we continued our walk along the Esplanade, we soon spied the ‘Birdcage’ Bandstand (1884), one of the finest surviving Victorian bandstands in the country. Its extravagant design has been compared to ‘oriental’ buildings such as the Alcazar in Seville or the Alhambra in Granada. Like much seaside architecture of the late-Victorian period, its ‘cake-icing’ decoration reflected its seaside context, where visitors escaped the drudgery of everyday life to escape into a more exotic, exciting and enchanted world. It was restored to its original specification and reopened in 2009. 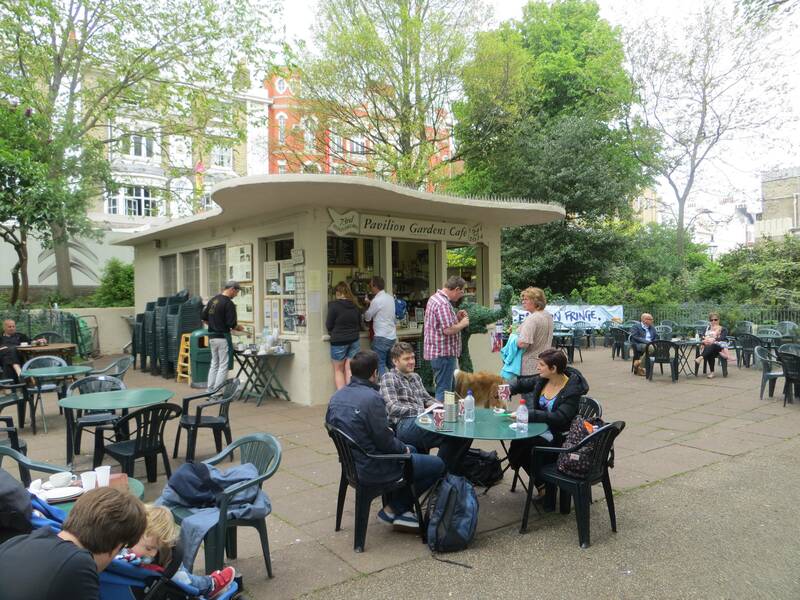 The Brighton Bandstand hosts a variety of bands every Sunday afternoon during the summer months. 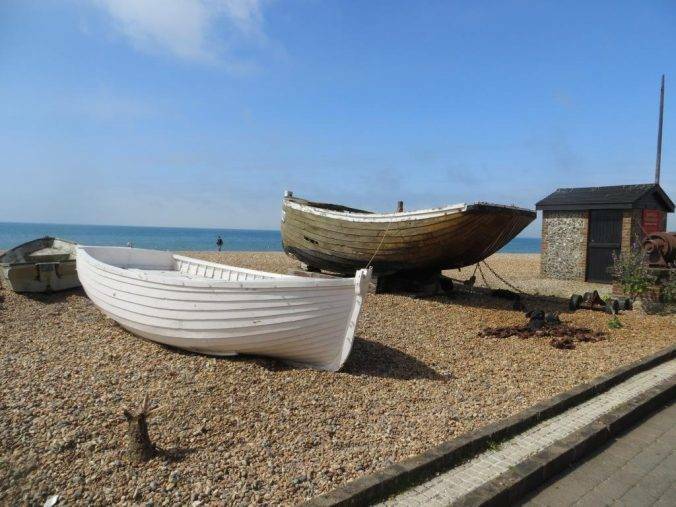 Next up is the Brighton Fishing Museum, with its intriguing collection of restored traditional Sussex clinker fishing boats laid up on the beach, a reminder of how the Brighton story (or should that be Brighthelmston) all began. In its original incarnation in 1823, Brighton’s first pier was the Old Chain Pier which was primarily used as a landing stage for passenger ships that sailed across the Channel to Dieppe. Realising its commercial value, the owners began charging an entry fee of 2d and set up kiosks selling souvenirs and confectionary as well as entertainment stalls with fortune tellers and silhouettists. 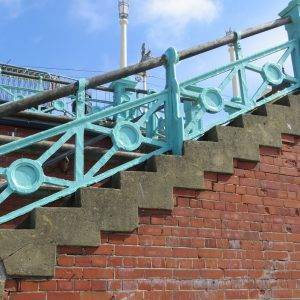 The Chain Pier was struck by many storms and eventually replaced in 1899 by the Brighton Marine Palace & Pier, which is what you see today. If you have time and you are a train buff, you will be unable to resist a small detour here to take a look at Volk’s Electrical Railway, which sets out just east of the pier and runs for 2kms to the Marina. Built in 1883, it is Britain’s oldest electric railway. 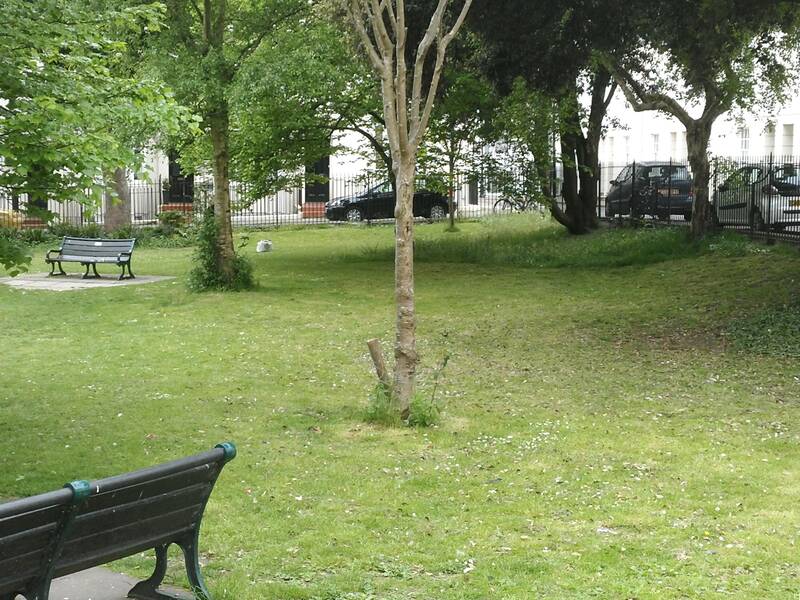 The area of Old Steine Gardens (1 hectare, 2.5 acres) was originally a natural drainage point, where the Wellesbourne River (now underground) met the sea. Local fishermen stored their boats and dried their nets here. 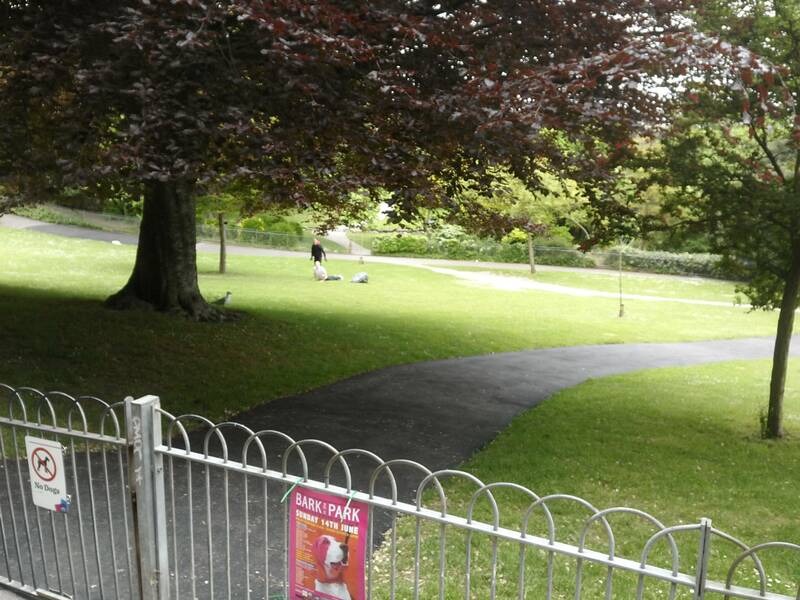 In the late nineteenth century, as part of ongoing ‘improvements’, the area was drained and enclosed, and visitors began to use the Steine to promenade. On the west side is Marlborough House (1765), a Grade I listed building with a chequered ownership history which has led to being placed on the Buildings at Risk list. It was first constructed as a red brick building but then altered to a Georgian design by Robert Adam. 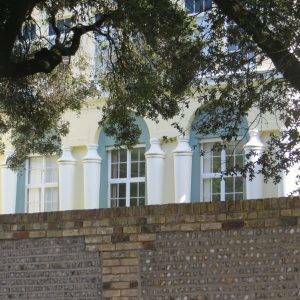 Pevsner describes it as “a Palladian great house in miniature” and it is generally regarded as the second most important building in Brighton after the Brighton Pavilion. Talking of which, you will either love or hate the Royal Pavilion, it’s a ‘Marmite’ type of taste. TripAdvisor comments split into two distinct camps. Firstly the breathless enthusiasts: “I have never visited anywhere quite like it for opulence.” “Built by the Prince Regent as a pleasure palace, one can only wish that you had been invited for one of the incredible dinners. 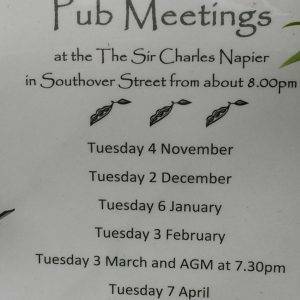 Oh to live as others lived.” Then the ‘roundheads’: “I have mixed feelings about this place. It was amazing to look at, but the decadence it represented was disturbing. The Prince, and later King, was generally hated by this subjects and the empire declined under his rule.”(that ending has a bit of a B- essay feel about it). For the record (you will get much more detail if you visit) The Royal Pavilion is a former royal residence. It was built in three stages, beginning in 1787, as a seaside retreat for George, Prince of Wales, who became the Prince Regent in 1811. The seaside town had become fashionable through the residence of George’s uncle, Prince Henry, Duke of Cumberland, whose tastes for cuisine, gaming, the theatre and fast living the young prince shared. And rather conveniently, his physician advised him that the seawater would be beneficial for his gout. Between 1815 and 1822 the designer John Nash redesigned and greatly extended the Pavilion, and it is the work of Nash which can be seen today. The palace has an Indo-Islamic appearance on the outside, whilst the fanciful interior design is heavily influenced by both Chinese and Indian fashion. Next, we snaked up Victoria Gardens (2 hectares, 4.9 acres), heading north along the line of the old river, at the bottom of a valley, steeper to the east than the west. 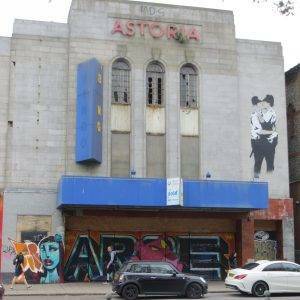 And past the Old Astoria Cinema, built in 1933 in the Art Deco style; and where, in 1966 I went as a very young lad with my sister to see Dr Zhivago, the first cinema outside London where it was shown and enjoying an 11-month run. 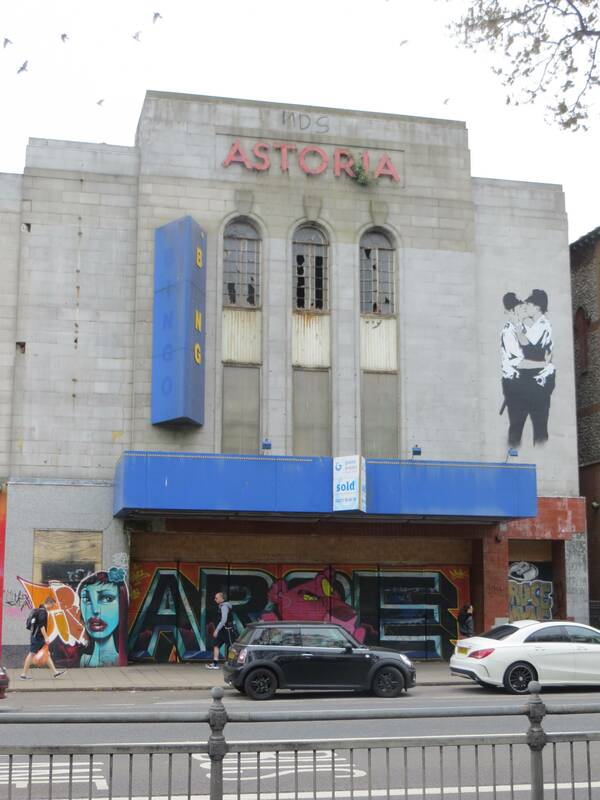 How I remembered the howls of the wolves across the icy tundra for many years to come … it closed as a cinema years ago, became a bingo hall for a period, and then fell out of use. Plans are afoot to re-develop it as student accommodation, not confident it will be there when I next pass..
Next, we take a sharp right (heading due east) up a flight of steps between two blocks of 12-storey flats to Richmond Heights, which affords views back to the centre of the city. This elevation reminds you, in case you had forgotten, that you have been walking up the Wellesbourne Valley, the river of which has flowed underground from the Pool Valley Rd (the A23), originating on the South Downs above Patcham. Our route took us towards Queen’s Park (6.5 hectares, 16.1 acres), a very early public park. 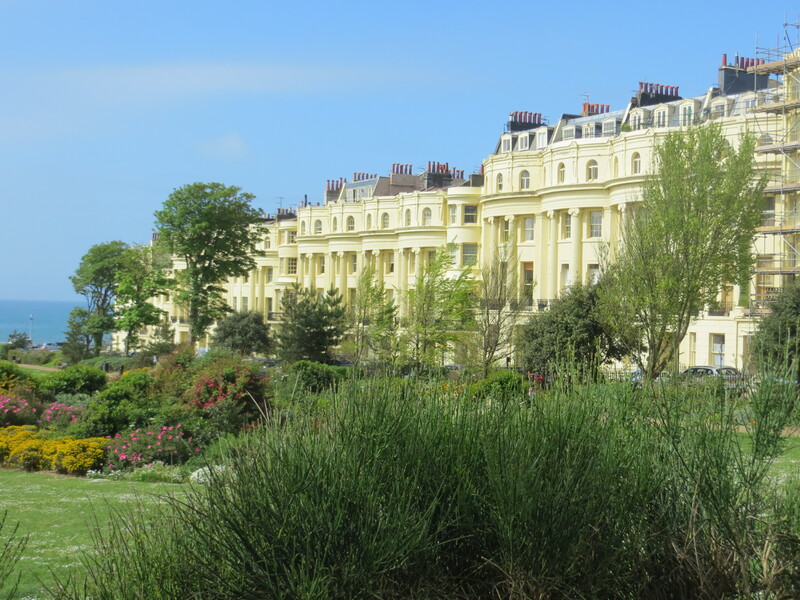 In 1825, Thomas Attree, a property owner and developer in Brighton, had acquired land to build a residential park surrounded by detached villas, inspired by Regent’s Park in London. He commissioned architect Charles Galloway to design it. Thomas renamed it after Queen Adelaide, consort of William IV. 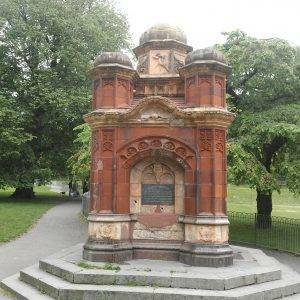 Queen Adelaide patronised the German Spa opened in 1825 at the south end of the park, which remained in operation until 1886 when it continued as a mineral water plant until 1960. It now houses the Royal Spa Nursery School. Thomas’ plan never fully (in fact only very partially) materialised and the surrounding housing is mostly late Victorian with some late 20th-century infill and replacement. But there was one notable exception. Thomas Attree employed architect Charles Barry (he of Houses of Parliament fame) to design a villa for him on the edge of the park, one of the earliest Italianate buildings in England. Sadly, few structural elements of the villa remain, but the ’Pepper Pot’ (1830) – which originally stood in the western part of the grounds – is still there at the top of Tower Rd. It was built at the same time as the villa, but uncertainty and intrigue surround its original use, although clearly it was intended to impress. We know for sure in the twentieth century it enjoyed (or suffered?!) a wide variety of uses – first as the publishing and print centre for the Brighton Daily Mail; then, during the Second World War, as a military observation post; after the war, the headquarters of a Scout troop, then an artist’s studio and – after an extension was built to the base in the 1960s – a public toilet. Nowadays it is sealed and unused, but still a curious point of architectural intrigue – was it originally a folly, a water tower, a sewer vent, an observatory, housing for a water pump, a spot for séances…take your pick! 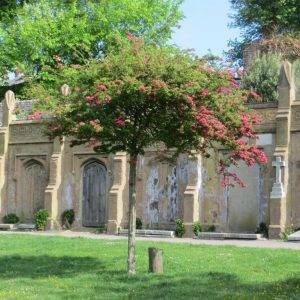 Today Queen’s Park (6.1 hectares, 15.2 acres) is a much loved public park, well planted with trees and shrubs. 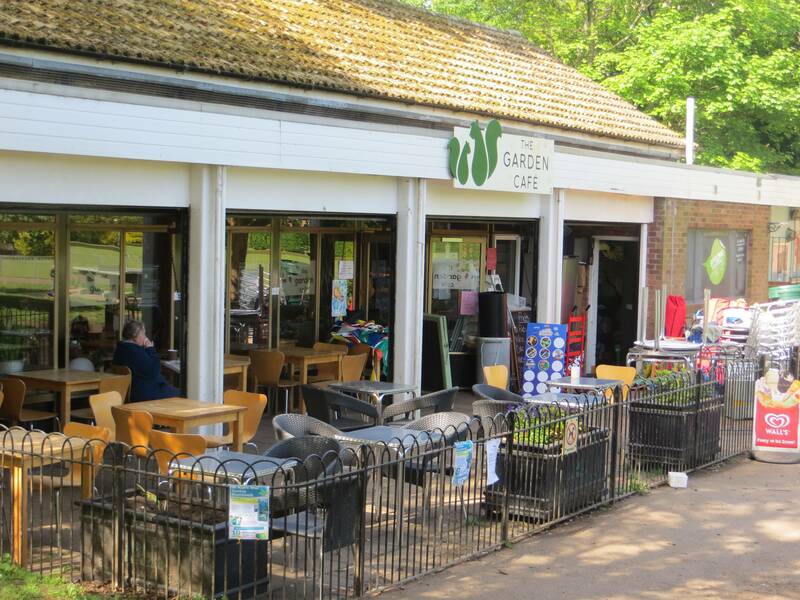 It has a large pond, along with a children’s play area, a café, a bowling green, tennis courts, and an area that is left untended to encourage wildlife. 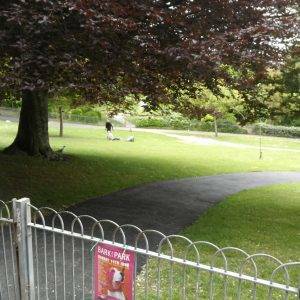 We found people of all ages here enjoying themselves – chatting, reflecting, running, cycling, playing ball games, doing all the sorts of things that parks are designed for. A city haven. We took the exit immediately to the right of the tennis courts and headed down Evelyn Terrace and then Bute St, at the end of which there are some steps up to Whitehawk Hill. This is an ancient habitat designated a Local Nature Reserve (LNR), with areas of species-rich chalk grassland supporting colonies of Adonis and Chalkhill Blue butterflies. From the top, there are panoramic views over the city and the sea, including the Isle of Wight on a clear day. 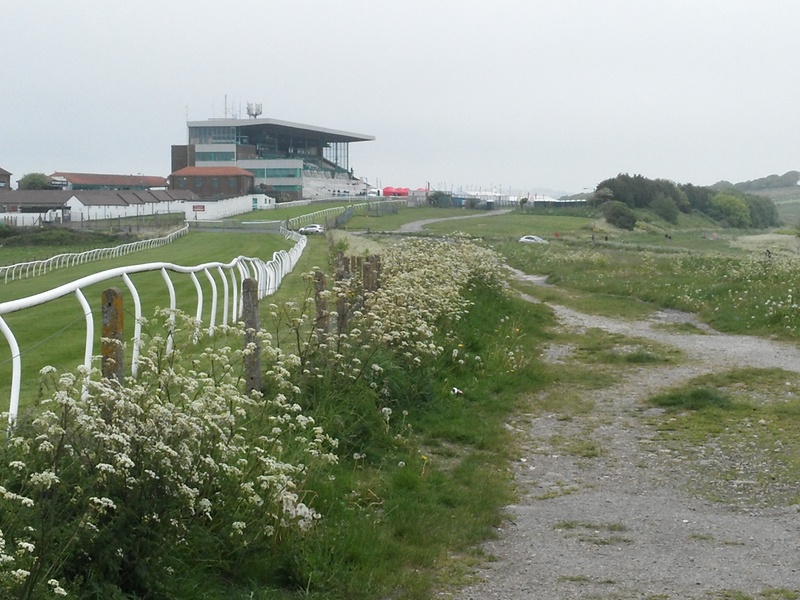 The first settlement in the Brighton area was here in Whitehawk Camp, directly opposite today’s racecourse stands, dating back to the Neolithic period between 3,500 BC and 2,700 BC. Archaeologists have only partially explored it, but have found numerous burial mounds, tools and bones, suggesting it was a place of some importance. Brighton Racecourse staged its first race in 1783; and according to legend, George IV, when still Prince of Wales, invented hurdle racing nearby whilst out riding with aristocratic friends. They found some sheep pens which they proceeded to jump for a bit of fun. The racecourse was home for a while to top class racing and was attended by fashionable society, but it drifted out of fashion when the Prince and his friends lost interest. The course began to thrive again, however, with the arrival of the railway, which enabled London punters to have a day at the races by the seaside. The shape of the track is also a particular feature of the course – it takes the form of a horseshoe one and a half miles long, making it one of only two British courses not to form a complete circuit (the other being Epsom). Taking the tunnel under the racecourse, we came out in the extensive and amazing Tenantry Down Allotments. 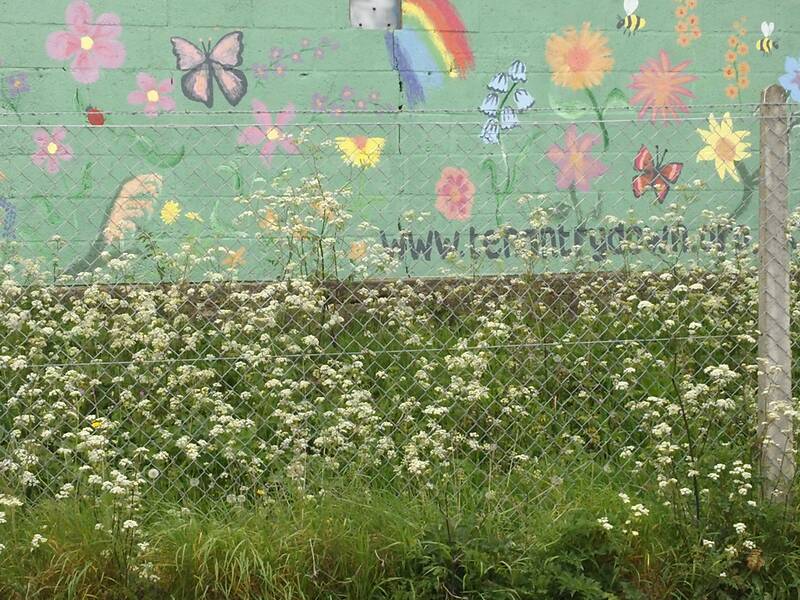 The land was purchased by the council in the 1880s and has been used for allotments ever since. The council website records that there are 274 plots with a waiting list of 144, the waiting list taking about three years! So popular, and the day we passed, it was a hive of early summer activity. And they enjoy the most amazing views over Brighton, which must make it hard on occasion to focus on the job in hand, especially if it’s back-breaking digging. Rental fees seem reasonable. As an example of allotment rent in 2015-16, for just £37.31 per year you could get a ‘half’ plot measuring approximately 125 square metres. This would give you sufficient ground to grow-your-own fruit and vegetables for a family. But the biggest ‘cost’ will undoubtedly be your time – a plot this size probably requires 10 hours a week to be fully productive. 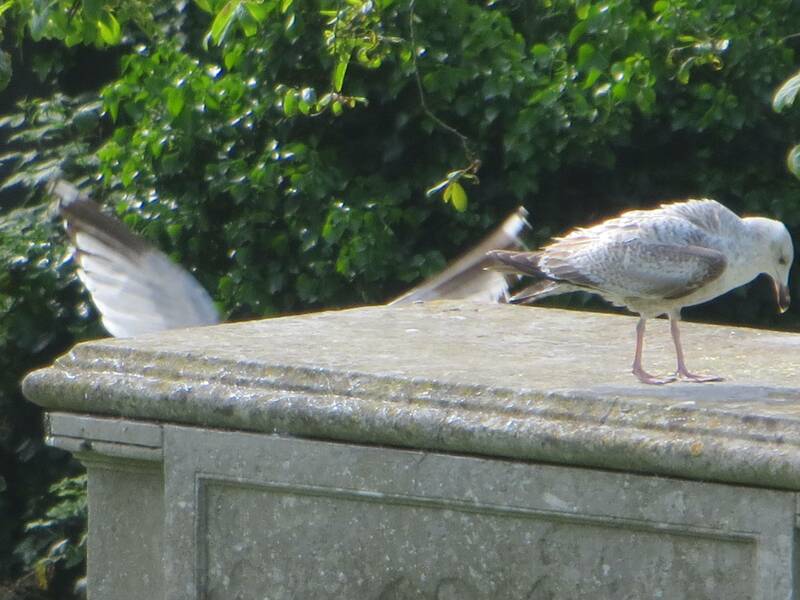 Next, we came to one of Brighton’s least visited but most tranquil and out-of-the-way green spaces, the Brighton Cemetery (Extra Mural & Woodvale Cemeteries). The Public Health Act 1848 had sought to improve sanitary conditions and public health in Britain’s rapidly expanding towns. 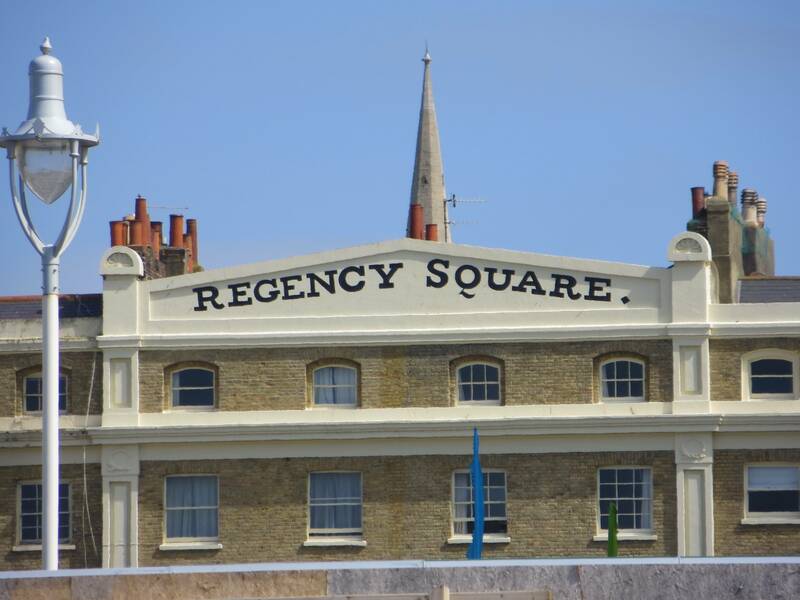 Edward Cresy, a Government health inspector, was sent to Brighton in 1849 to report on its conditions and recommend actions which would make the town compliant with the Act. 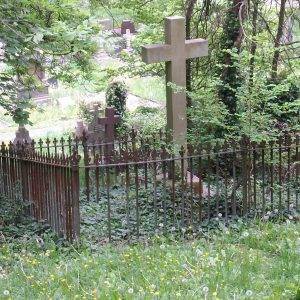 He advised that burials around the town’s churches and chapels should cease. 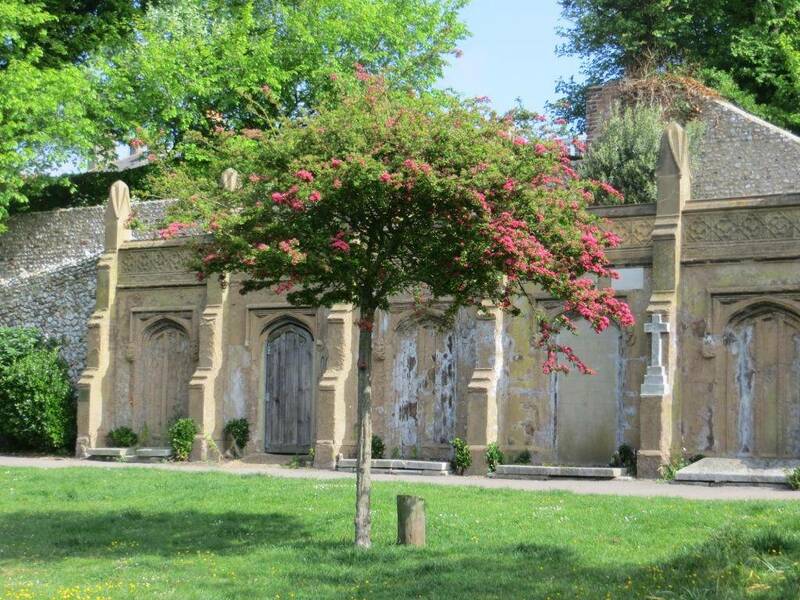 As a result, in 1850, a group of public figures formed the Brighton Extra Mural Company for the purposes of acquiring land and establishing a private cemetery, which was opened in 1851. 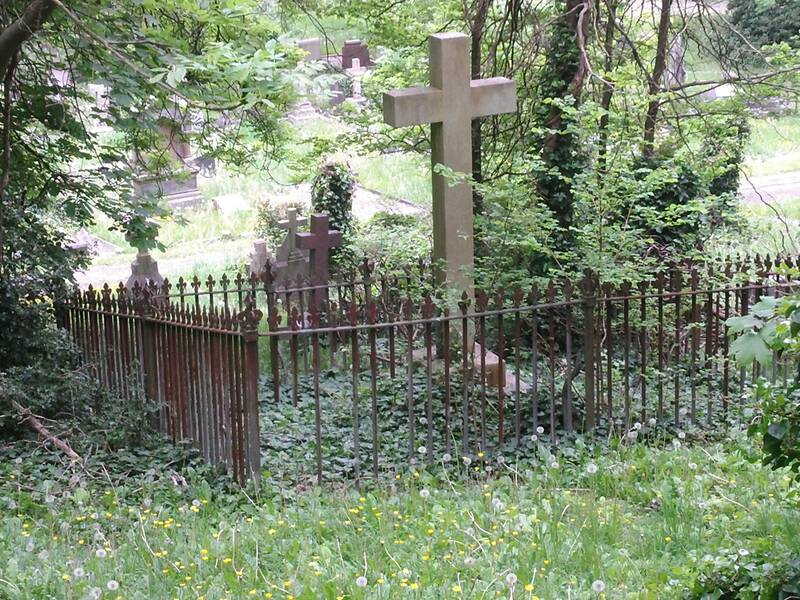 The Extra Mural Cemetery occupies one of the most delightful spots in the whole of Brighton: a sheltered, gently sloping, well-wooded area of downland between two much steeper hills. 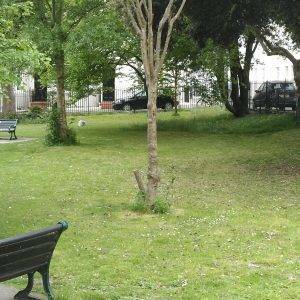 As early as 1880, its potential as a green space as well as a burial ground was recognised when J.G. 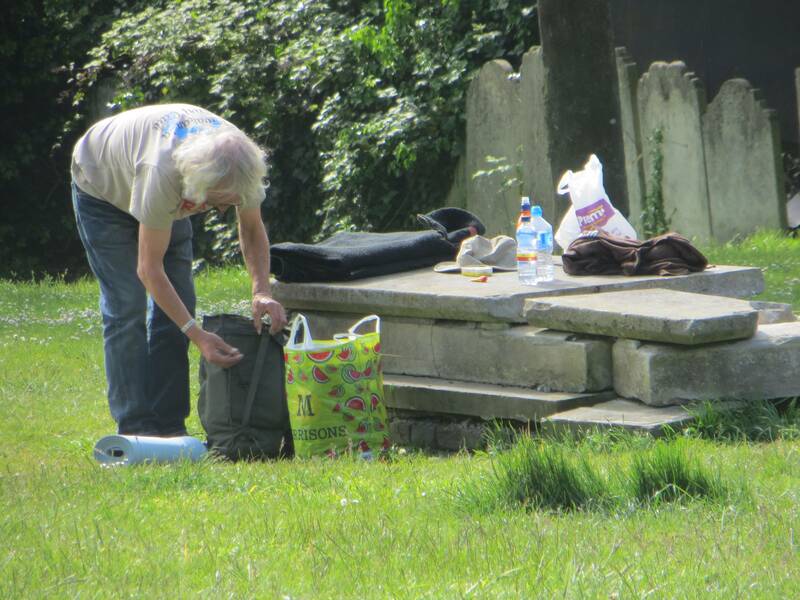 Bishop published a walking guide called Strolls in the Brighton Extra Mural Cemetery. 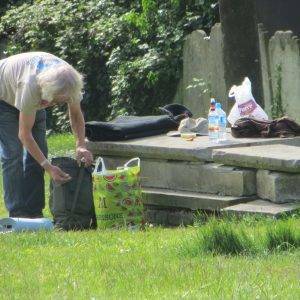 What he first discovered you can still enjoy today – the cemetery is a delight to walk through – headstones, more elaborate and ornate tombs and a gothic revival chapel, all within a leafy landscape of studied neglect. 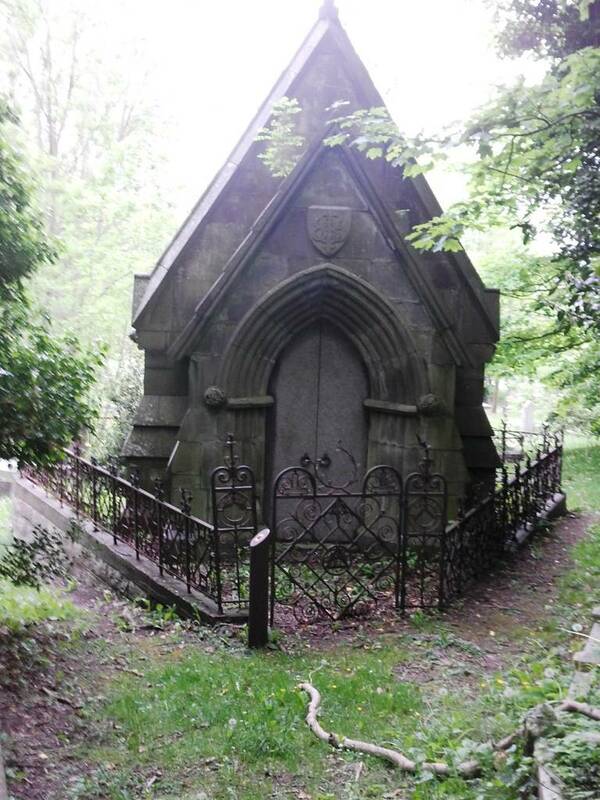 Six tombs are listed by English Heritage for their architectural and historical interest, and there is a Tomb Trail marked with arrows which is worth taking if you have a bit of spare time at this stage (or come back another time; it’s not to be missed). One of the largest and most distinctive monuments is the Grade II-listed Ginnett family tomb, made of granite, marble and Portland stone, with Classical-style embellishments. John Frederick Ginnett was a circus proprietor who owned a popular circus and theatre at Park Crescent in the Round Hill area of Brighton, so it’s perhaps no surprise he went for something so dramatic. 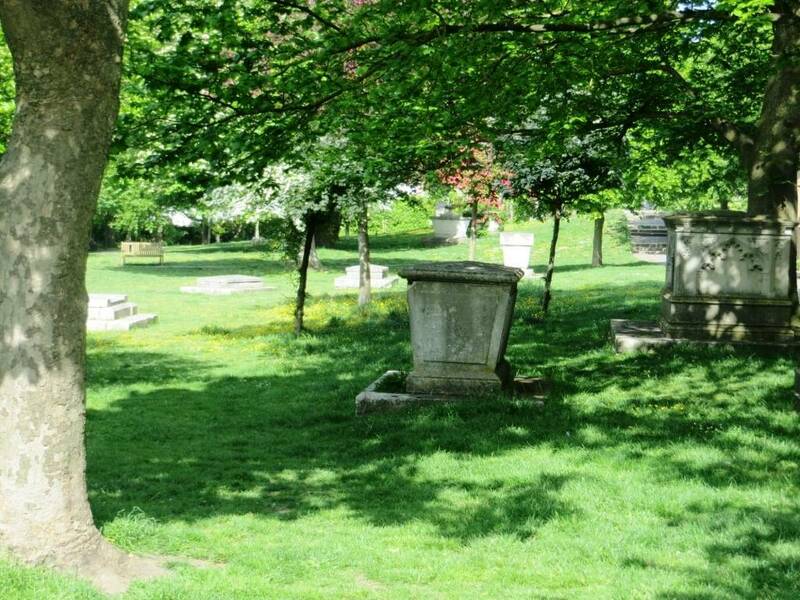 When we visited the cemetery we were the only people there, or at least we thought we were until we reached the Ginnett family monument – for suddenly we saw an outstretched limb hanging over the rim of the marble top. A soft antipodean accent greeted us: “Morning guys, what brings you here?” We wanted to ask the same question, but felt it better to reply first; “The beauty and tranquillity of the place, the fact that as your thoughts turn to mortality so the birdsong becomes much more intense and musical.” “Which is why I come here too,” he responded, as it became clear that he was not just meditating up there, he was carrying out his physical exercises. 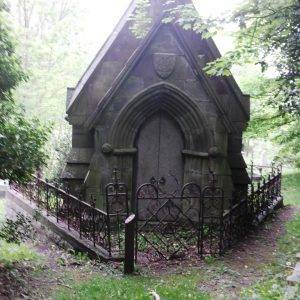 I wonder if he knew it was a circus man’s tomb? 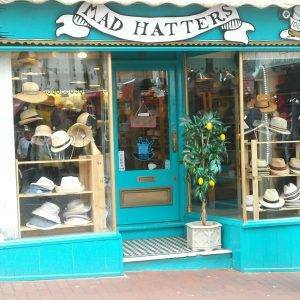 If the rest of Brighton knew about this place, it would be much more frequented! Now we’re on the final leg of the journey, but still much to see. The Level (6.4 hectares, 15.7 acres) used to be open grassland set within an agricultural landscape. The two streams which ran down the valleys of London Road and Lewes Road (the Wellesbourne and Springbourne rivers) converge here and consequently, The Level was marshy and prone to flooding. Cricket was played here from the mid 18th Century until 1822 when the space was formally laid out by A H Wilds and the local botanist/landscape gardener Henry Philips. Elm avenues were planted along the outer pathway in 1844. 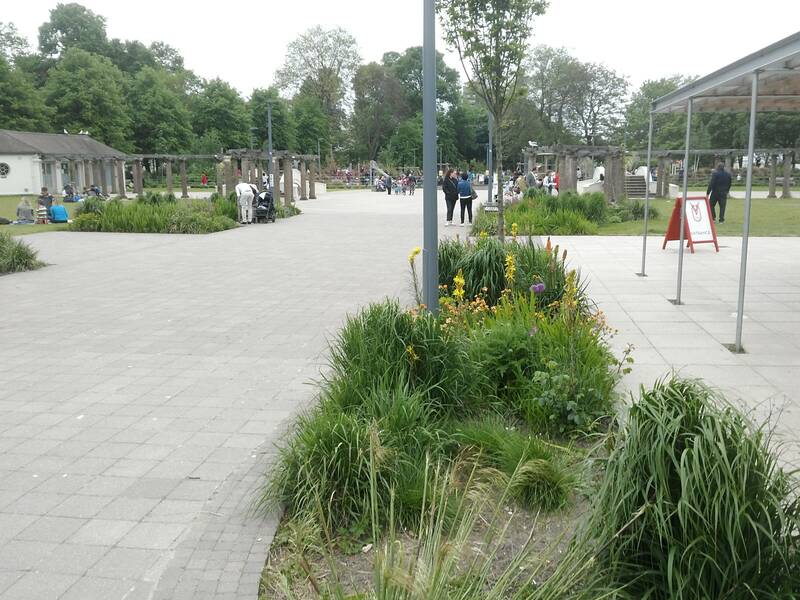 The area has recently been restored, with the south end now comprising a children’s play area, fountains, sensory gardens and a new skate park. 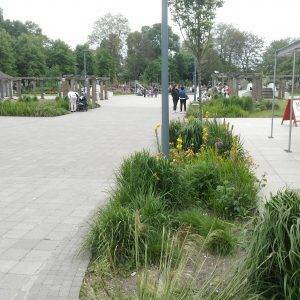 It gets very good ratings on the internet: “The Level is really what a city centre park should be. 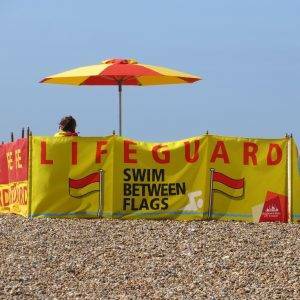 No, it’s not an escape from the world, but it is a living, breathing part of Brighton in all its often messy glory.” Here, here. The Open Market, just to the east of the Levels, reached through a multicoloured and inviting archway, is a great place to stop for a snack and a drink. The original market, which had been on The Level itself, dates back to the 1880s when barrow boys began selling fruit and vegetables. 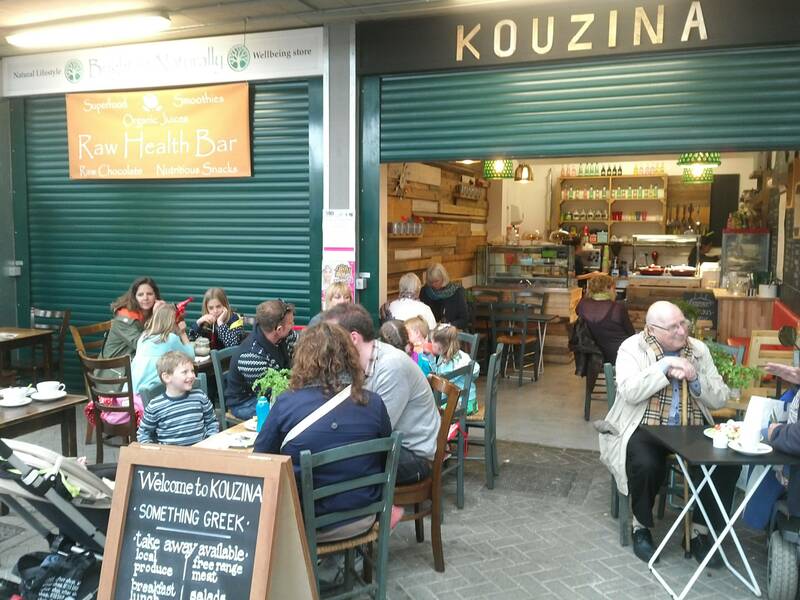 The historic Open Market underwent a major redevelopment in 2014 and is now home to over 50 local producers and creators. I slumped down into an inviting-looking sofa in one of the several cafés there only to discover it had no springs left and my bottom continued its trajectory at pace until halted by the concrete floor. Ouch. You can’t be too careful with vintage sofas. St Peter’s Church (1828), just to the south of The Level, was built f to a design by Sir Charles Barry and is a fine example of the pre-Victorian Gothic Revival style. It was the parish church of Brighton from 1873 to 2007 and is sometimes unofficially referred to as ‘Brighton’s Cathedral’. Finally, we headed up Trafalgar St to the North Laines, with the quaint mid-19th century Pelham Square on our left. “Laine” is a Sussex dialect term for an open tract of land at the base of the Downs, not a council mis-spelling. Ken Fines was Borough Planning Officer for Brighton from 1974 to 1983. He is credited with having saved the North Laine area from extensive redevelopment that could have seen existing buildings being replaced by new high-rise buildings, a flyover and a large car park. 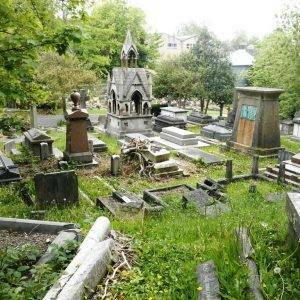 Fines believed the area had charm and pressured the local council to retain it. After considerable opposition by council members and businesses, the council eventually came round to his view, and the North Laine Conservation Area was designated in 1977. An early pioneer for interesting, walkable, independent space in cities, I take my hat off to him. 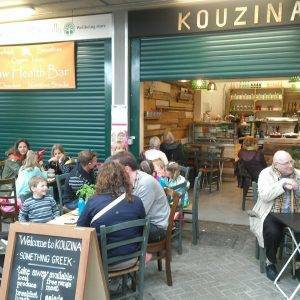 Today North Laine is an ‘indie’ shopping area popular both with locals and tourists, well served with cafés, bars and entertainment venues. 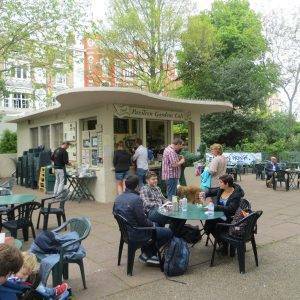 The first branch of Anita Roddick’s Body Shop was opened in nearby Kensington Gardens. Typical retailers include galleries, antiques, architectural salvage, second-hand books, music, retro clothing, graphic novels, musical instruments and new age paraphernalia. Now we are back at the station, where we begun. I bet you enjoyed that!? At the end of this road take another passageway which leads directly to St Nicholas Church. Head round to the S side of the church. 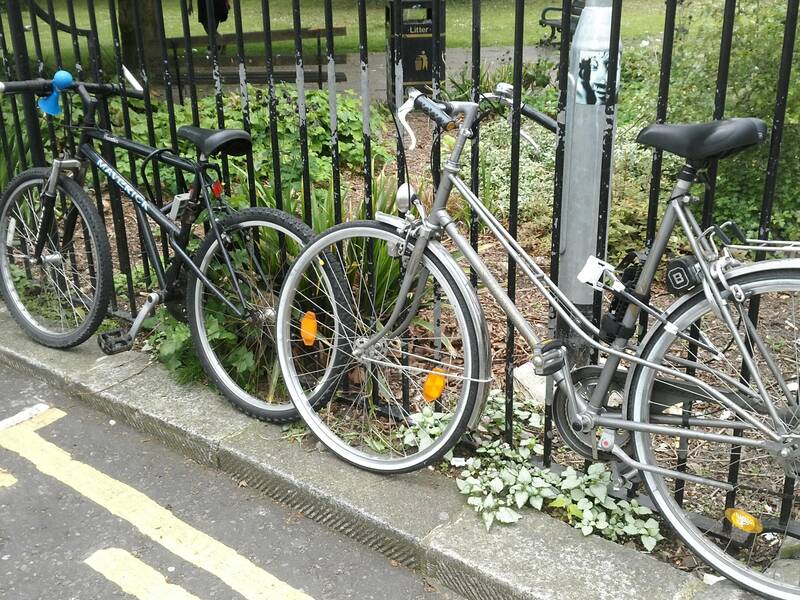 (If you have time at this point, pop into St Nicholas Rest Garden through the archway to the W of the church on the other side of Dyke Rd). Just after the church turn right, cross the London Rd and proceed up Trafalgar St W opposite, to return to the station. 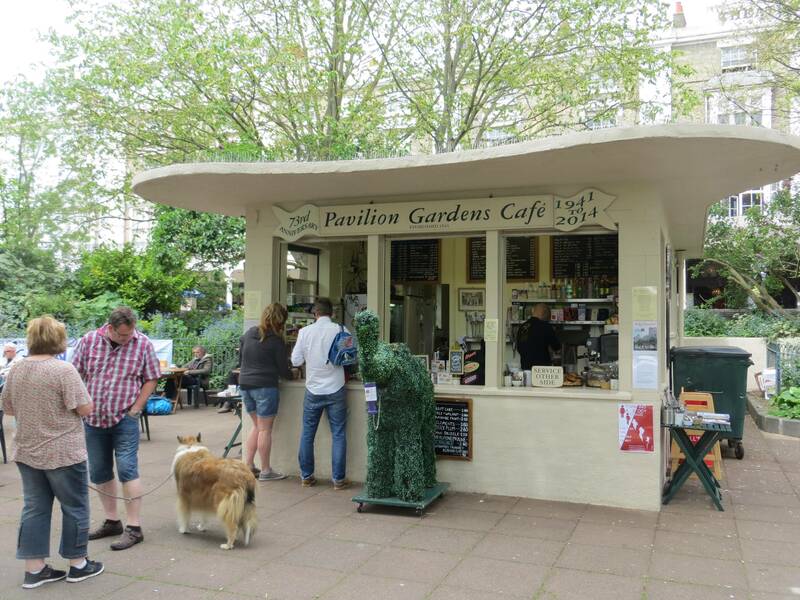 The Garden Café, St Anne’s Gardens (01273 735187, www.thegardencafehove.co.uk) is a very welcoming spot. Jack & Linda Mills Traditional Fish Smokers on the Esplanade (by the Arches, 01273 723 064). Jack and Linda Mills have been fishermen most of their lives and have been traditionally smoking fish at Brighton Fishing Quarter for many years now. You won’t get a better smoked fish sandwich in Brighton. 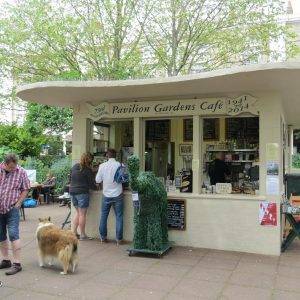 Pavilion Garden Café (01273 730712) is a great location on a sunny day. 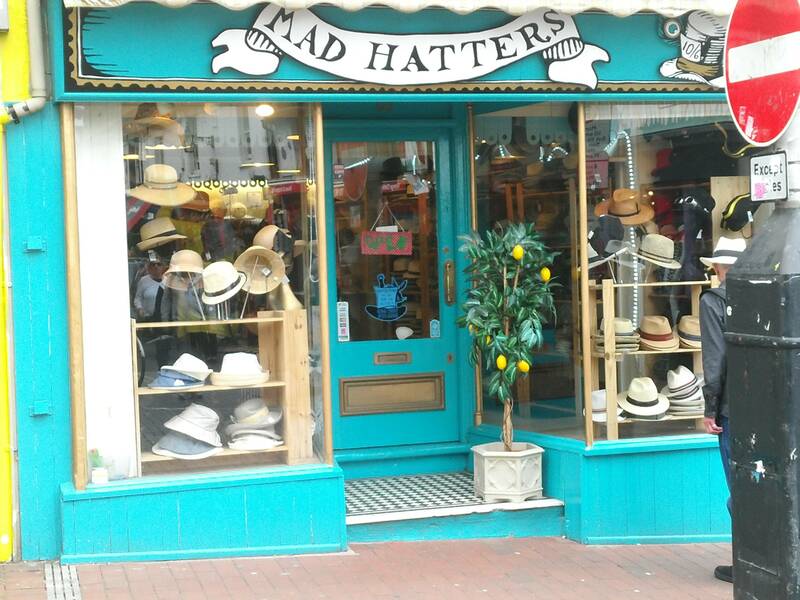 A bit of a Brighton institution. 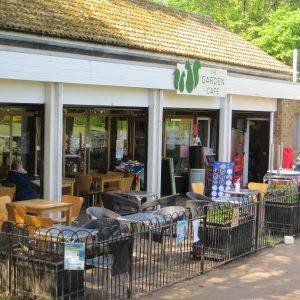 The Open Market (BN1 4GE) at the Levels has several really good indie cafes; towards the end of the walk. The North Laines is outstanding, with a huge mix of interesting indies and unusual stuff. The Open Market (BN1 4GE) just to the east of the Levels, has 50 stalls or so, especially strong on jewellery and knitwear. Brighton Fishing Museum (on the beach, 01273 723064, www.brightonfishingmuseum.org.uk) beautifully preserved boats and fascinating histories. Brighton Museum and Art Gallery, in the grounds of The Brighton Pavilion (0300 029 0900, brightonmuseums.org.uk/brighton). Lots of local history, design and artworks. 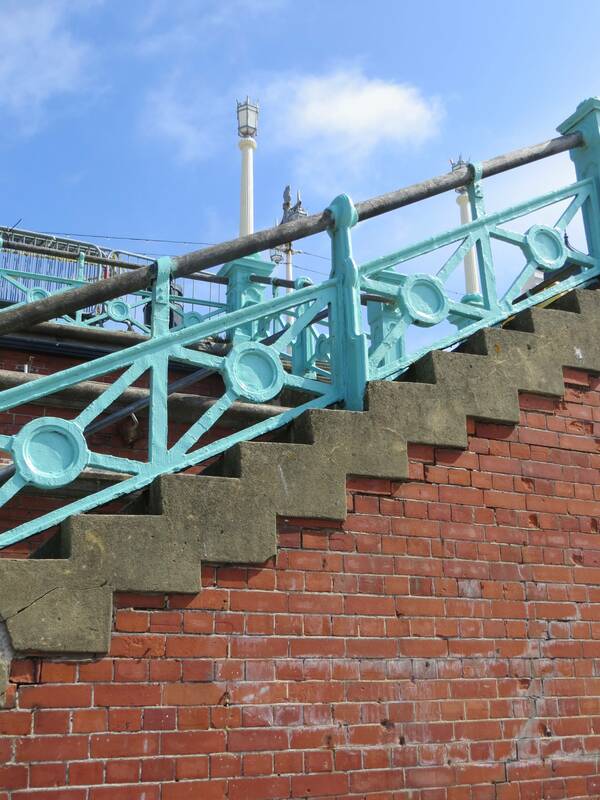 Read: Cheeky Walks in Brighton & Sussex, Tim Bick & others. At last, a walking book that’s funny. 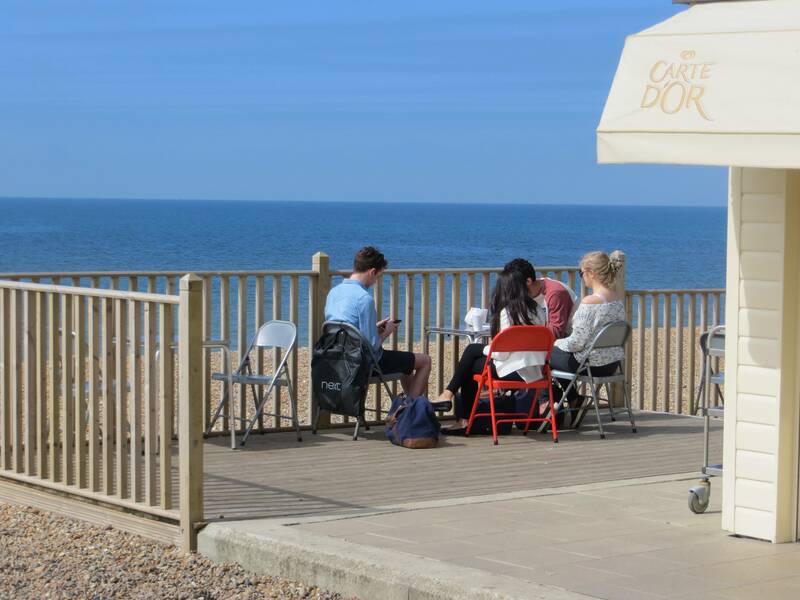 Visit: The University of Sussex campus. Writing about the creation of the University in 1961, founding architect Sir Basil Spence said: “The whole precinct should have the ‘sense of a university’ and should, if possible, grow out of the soil of Sussex to become a natural part of this beautiful site”. taker their self-guided campus tour.